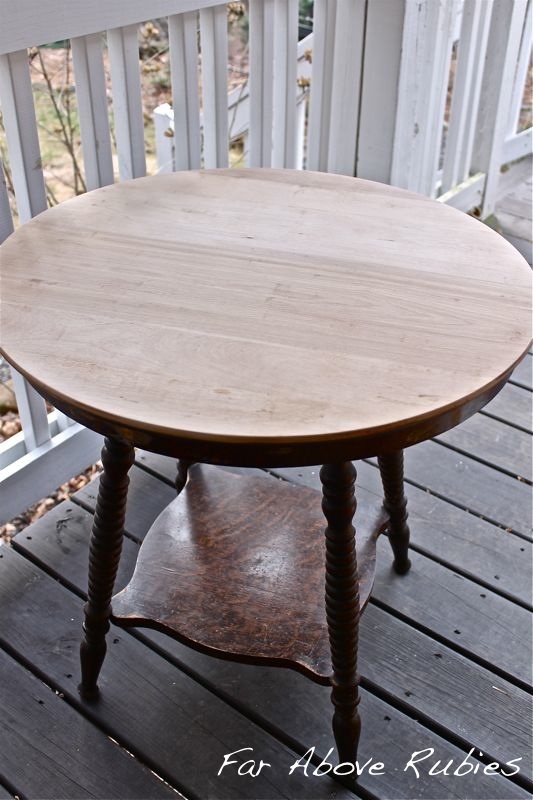 I recently refinished a table that belonged to my great grandmother. I have had this table for years and was using it in my girl's room, but needed a round table in the living room, so I decided to give it a facelift. It was coated in something that looked like a plastic/paper veneer. Here is the top after we sanded it with really heavy duty sandpaper on the belt sander. You can see it on this part. Not sure what it is and why they would have used it back then. It was hard to get off, but the belt sander worked with a little a lot of elbow grease. 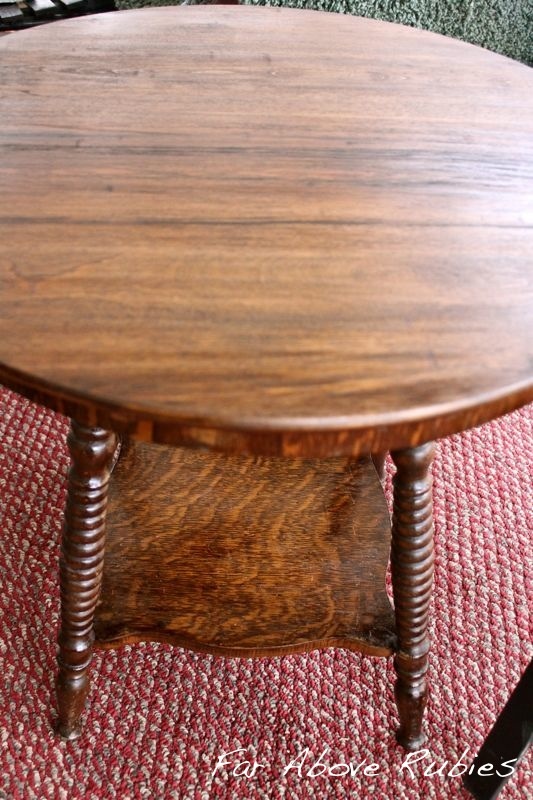 I then used Minwax oil-based dark walnut stain. I really loved the color but it was not quite as dark as the bottom and the legs. After a couple days of drying, I coated it with Minwax dark oak polyurethane stain and finish, which made the color perfect. I still wanted it to look old and have some imperfections. 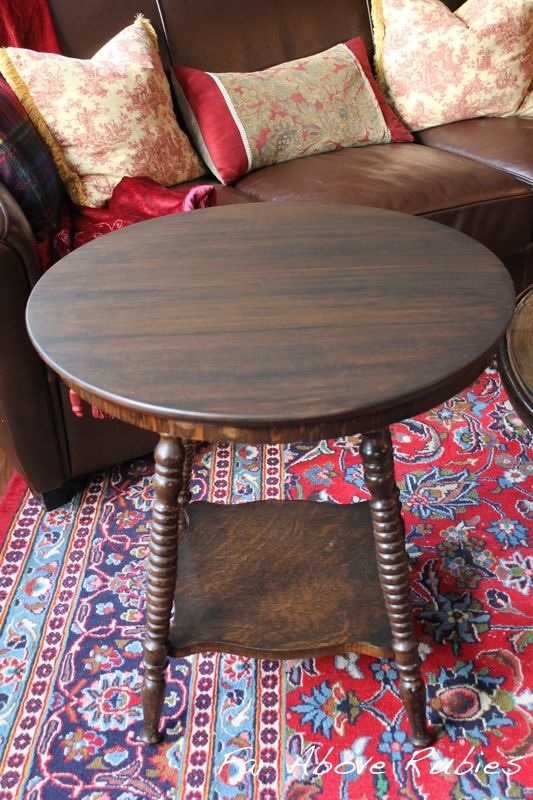 I also cut the legs off about 4 inches so it would be a better height for an end table, and it works really well. I topped it with my grandfather's old books, and some photos of his mom, who owned the table. I'm really happy with how it turned out. 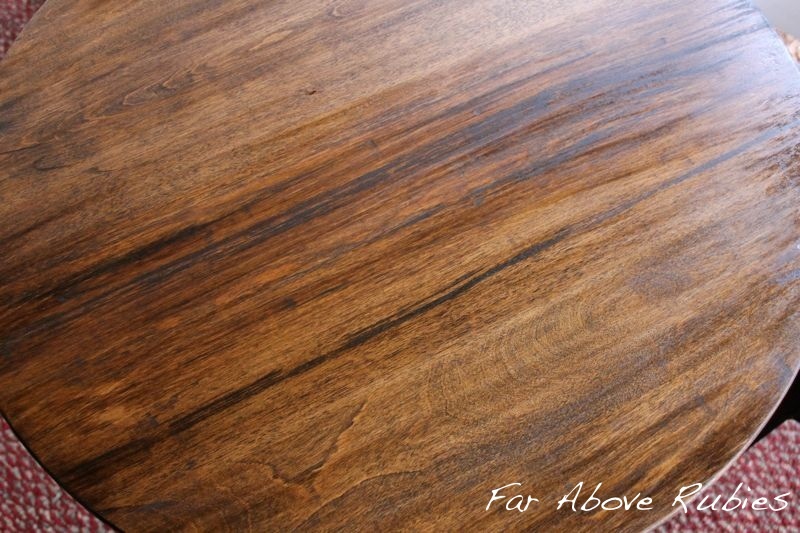 I love the dark wood, and now it can stand up to three kids, their cars, blocks, toy horses, etc., or a hot cup of tea. I'm happier knowing that I'm still using something that both my great grandmothers used. Thanks so much for stopping by! We have been busy getting music ready for different things we have coming up, plus the usual music we do every weekend. I have a bathroom facelift to show as I made a ruffled shower curtain similar to the one in the kitchen. We need to trim out the mirror, and because I always use reclaimed wood, it takes longer getting it straight, etc. At least that's what my husband tells me. Anita, both the table and the vignette are beautiful! 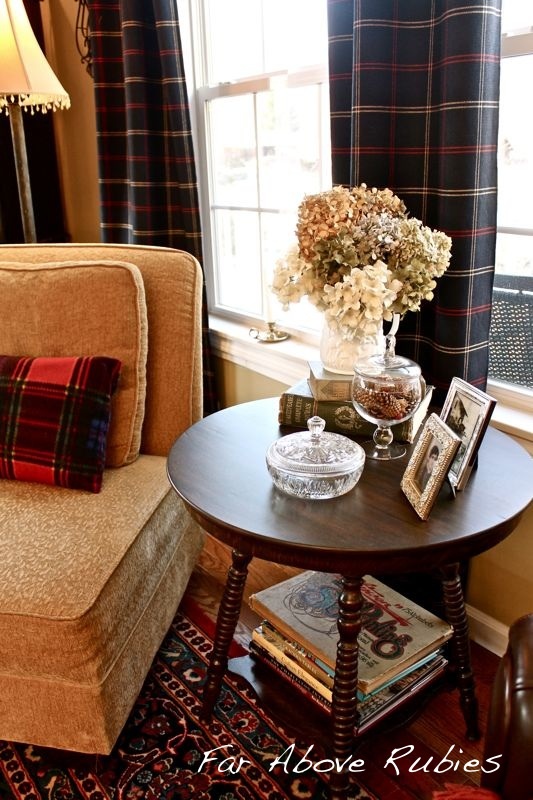 I love seeing how you incorporate your granparents' treasures into your decor. What a great tribute to them! You did an excellent job on the table! Your vignette is pretty too. 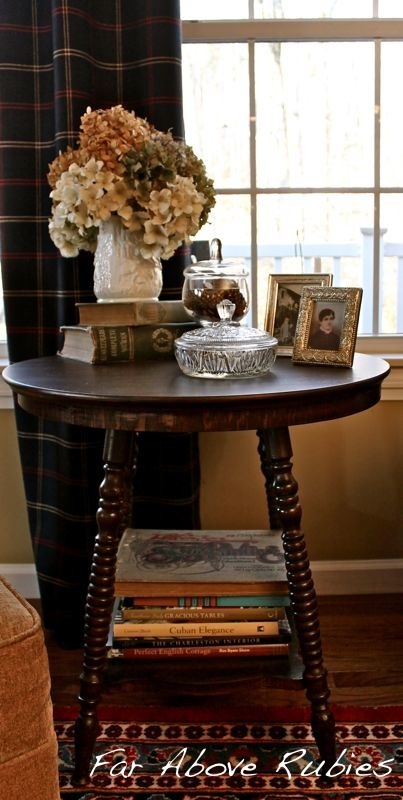 I love that style of table. The spindle legs are so interesting. 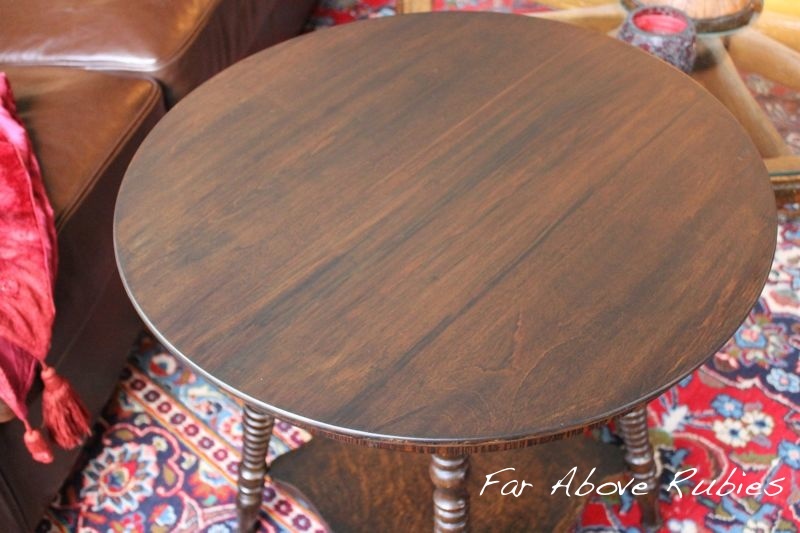 You did a great job on refinishing the top! You and I are such kindred souls! I love that table, not just in style and form but because it was a family piece. Nothing in my mind compares to using that which was loved and used by family. You did a wonderful job with it, and I think the vignette is perfect. It was a treat to come here this morning. Beautiful job Anita and beautiful vignette!! LOVE that last shot! Anita, me ha gustado mucho el tratamiento que le das a la madera vieja, esta mesa se ve fabulosa. Es bueno atesorar esos recuerdos de familia. Saludos. Oh Anita, I love this. Looks beautiful. My mom recently found an honest restorer who fixed her grandmothers settee and reupholstered it too. He's going to work on a bench and chair that I have from my great grandmother. Can't wait!! Love all your new changes. Your house looks beautiful. It turned out great and looks beautiful. 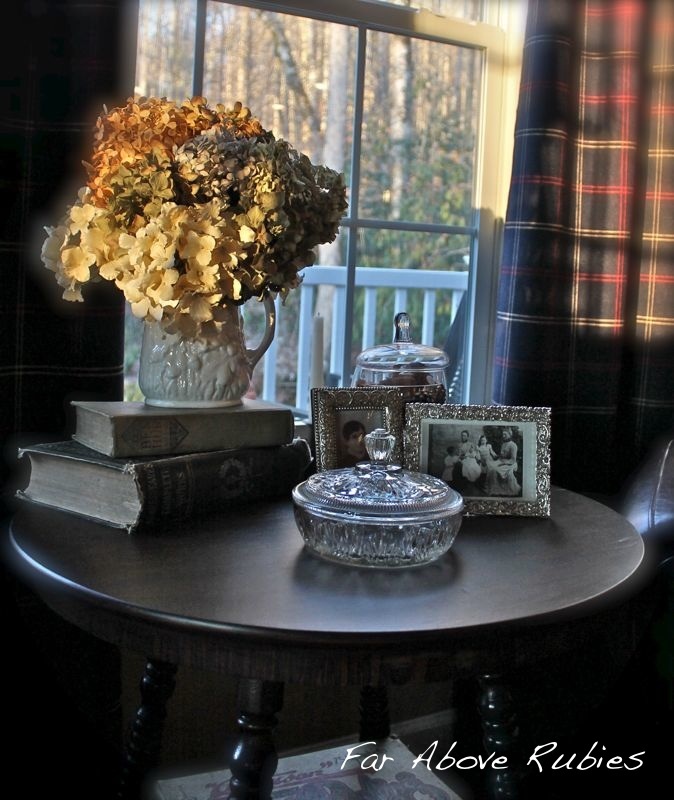 I am so happy you treasure you great grandmothers table..I am sure she would be happy. What a beautiful job! I'm so intimidated to try something like that. You are giving me inspiration to try it. Thanks. I'm sitting here trying to think of why someone would have put a paper/plastic veneer on a table of this age. Looking at the shelf, it looks like it's supposed to be quarter sawn oak, which was/is a more expensive cut of wood. Maybe putting a faux quarter sawn oak veneer was a less expensive method of production for a furniture company...but looked like the real thing??? The top is really pretty now that you've sanded and finished it. Love the dark stained look. Nice job and cutting off the legs was brilliant. What a great "refreshing" of this family treasure! 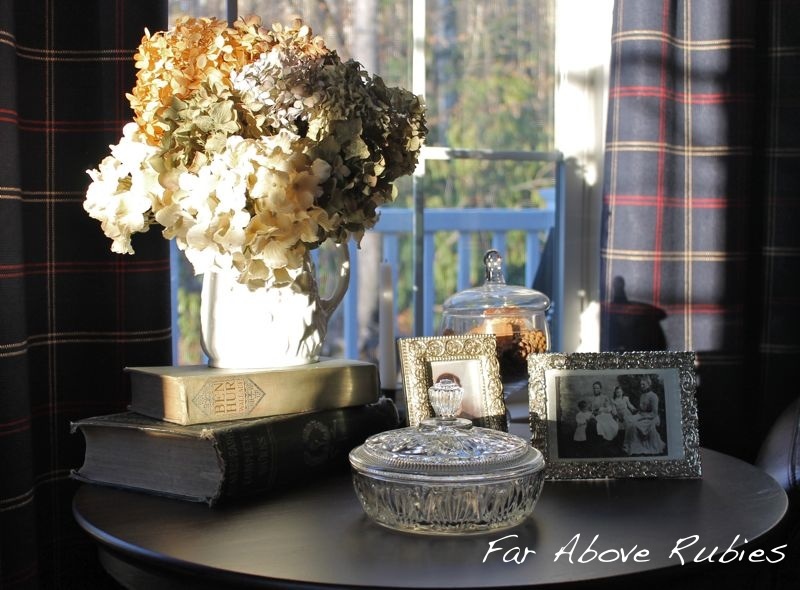 The vignette you've created on top of the table looks wonderful -- love all the neutrals together with the silver frames. enjoy everyday. I love the dark stain and your lovely photos, flowers and crystal. Your English country cottage theme reminds me of Victoria Magazine issues,so pretty, soft and welcoming.I give you so much credit with all you do and working on home projects. Your home is so elegant and filled with honoring your wonderful heritage. Thank you and much success on the bathroom redo.The shower curtain sounds so wonderful! I love the new look! 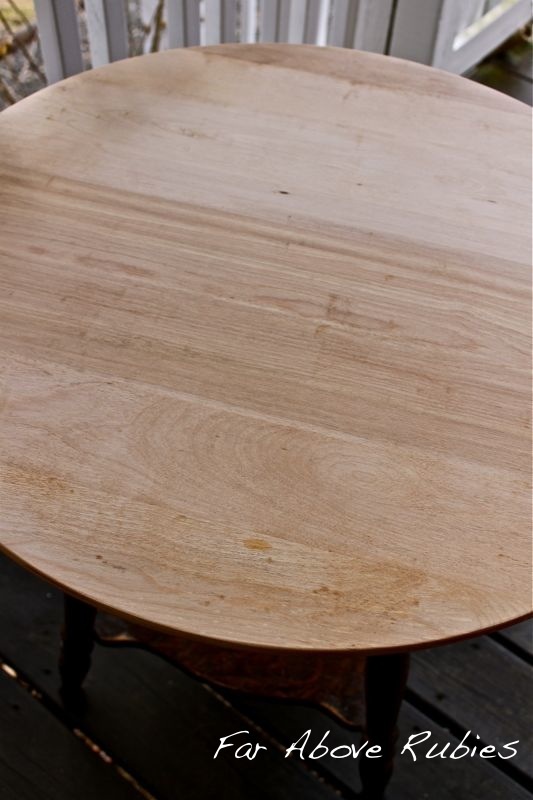 You've done a really fantastic job refinishing your table - and look at it now! What a beauty!! You did a fantastic job with this table, Anita! Wow!!! LOTS of patience involved there!!! Beautiful Anita! You and I are so much alike with our taste and sentiment in decorating. Thank you so much for your sweet comment. I too, get tired of the same following trends and quite frankly don't get it. I think people waste their money, and then realize it was something they never really liked, they just tried to force it. The table turned out beautifully, and I really like how you styled the top. You did a great job on the table...your grandmother would be so happy. I recently did some refinishing on my grandmother's victorian sofa, I know she would be pleased. What a treasure! Beautiful job on your styling too! What a beautiful table! I absolutely love antiques. 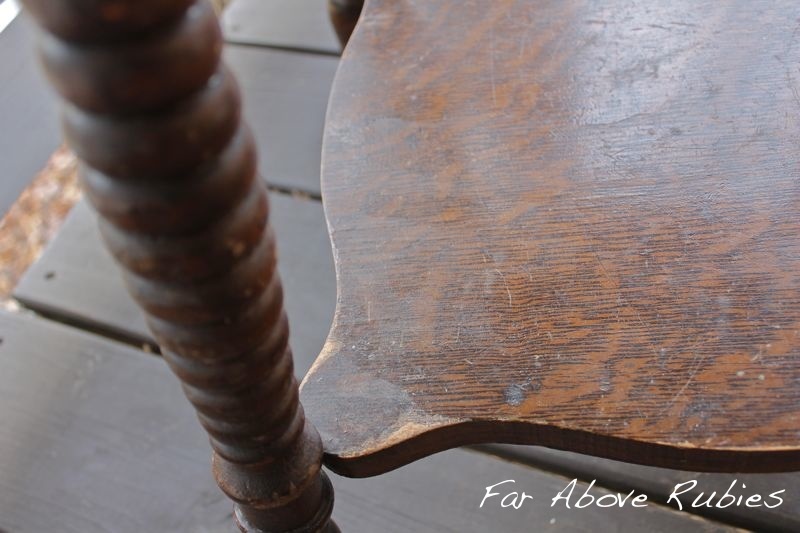 Refinishing furniture is hard work, but it always pays off! It looks gorgeous! That looks wonderful! I love tables like that! Thank you for joining me at Home Sweet Home!